When I tuned into the Bernstein & McKnight show on 670 The Score this morning, I was hoping to get something concrete on the Cubs’ *still technically scheduled* makeup game against the Washington Nationals tomorrow … you know, the one during the hurricane. Sadly, there was not much of substance there. 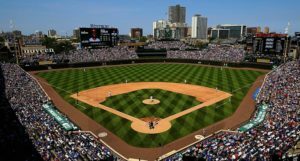 The Cubs are still pushing the league hard to reschedule that game for after the season and the league still wants to wait. According to Theo Epstein, the league is suggesting that the storm has veered far enough south (for now), that Washington D.C. may not be dramatically affected. Indeed, they’re asking for more time to see an updated forecast before making a decision. But obviously, that’s a little beside the point, right? The broader problem here is not should the Cubs play in a hurricane, because nobody wants that, including the league. It’s that if this game is actually played tomorrow, the Cubs will have had 30 scheduled games in 30 days … in the middle of a pennant race, which is absolutely nuts. And twice in that stretch, they will have had to fly to a location for a single game, and then fly out the next day. 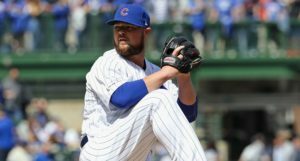 Everyone seems to be tip-toeing around calling it an excuse, but I have no such reservations: that’s an unfair way to go about this obviously unpreventable series of events, especially when you consider the necessary travel, the number of other rainouts the Cubs have had, and the perfectly simple and amenable solution of playing the game on October 1st. It just doesn’t make sense. Theo Epstein says he “knows” the league won’t send the Cubs into a dangerous situation, but he only hopes they won’t send them into a situation where another rainout is even possible. If the Cubs get on a plane tomorrow, this will have been handled poorly – whether it rains in D.C. or not. We already discussed Jose Quintana’s brilliant start earlier today, but Epstein’s comments seem relevant. According to the Cubs president, Quintana made a minor mechanical adjustment about 3-4 starts ago (something about staying over the top of the rubber better) and it’s had a disproportionately positive effect, as minor changes sometimes can have. More specifically, Epstein also mentioned that “it’s all about his heater,” adding that Quintana was working with depressed velocity for most of the season, but now that he’s got that extra tick or two, it’s all coming together. Hmm … where did I hear that before? As for the offense’s continued inability to remain consistent and hit with runners in scoring position … Epstein is aware. “We haven’t really clicked yet in August or September offensively …. Our power is dramatically down with runners on base or in scoring position.” Unfortunately, he’s not quite sure this is a simple sample size fluke or sprinkle of bad luck and randomness. He considers it a problem with the team’s overall approach and is something he hopes changes before the calendar flips to October. In response to the offensive struggles, Epstein wouldn’t mind if the Cubs continued to be more aggressive (on the base paths, at the plate, whatever) because at this point in the season, “everything is on the table.” Epstein suggested that the Cubs need to do whatever they can and use whomever they can to win a game. He even said it doesn’t matter if you’re in a slump or if you don’t feel good, we’re at an “all hands on deck” moment in the season. This is it. Speaking of guys who don’t feel good, Brandon Morrow’s schedule (another bullpen session, then a simulated game, then he can be up with the team as soon as next week) was confirmed by Epstein, though he did add a little more context. According to Epstein, there’s still a very wide range of outcomes for Morrow’s return. He might be as good as he was earlier this season and will be able to go back-to-back not long after returning … or he might not feel strong after this next bullpen/sim game and could not return at all. Obviously, Epstein is expecting something in the middle, but that’s the level of uncertainty with which they’re working. Even still, it came off to me as decidedly optimistic. “I think there’s a decent chance he’s gonna help us,” said Epstein, before conceding that Morrow probably won’t win back the closer job right away, but that it could happen before October. I’m feeling good about his ability to return in some capacity as of today. 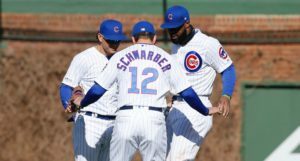 As for Jason Heyward, Theo Epstein said he didn’t have a firm timetable for us, before suggesting that he could be back on the field as soon next week. But I’m not sure if he meant more fielding/running/rehabbing or literally in a Cubs uniform/in the lineup, so I’m not exactly sure where he’s at with that. Theo Epstein said of Jason Heyward: "Hopefully sometime next week, to see him on the field would be nice." And finally, Epstein believes that, despite the pitching problems they’ve experienced this season and the general lack of top pitching prospects knocking down the door, he would still build around position players if he could do it all again. He even quipped about biting their tongues when the Mets beat them in the 2015 NLCS, because they still believed they had the better team. He was right. He always is.